Heat the milk and cream together until just steaming. Remove from heat. Meanwhile, mix milk powder, sugar, gelatin, and salt together in a large bowl. 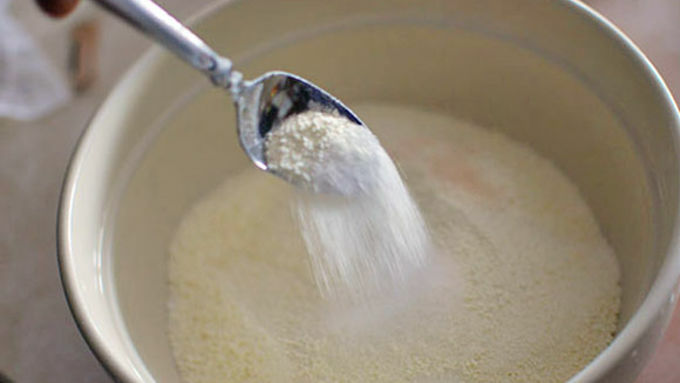 Pour hot cream mixture into the bowl and mix well until the powders and sugar have dissolved. Mix in the pumpkin, vanilla, cinnamon, and nutmeg. 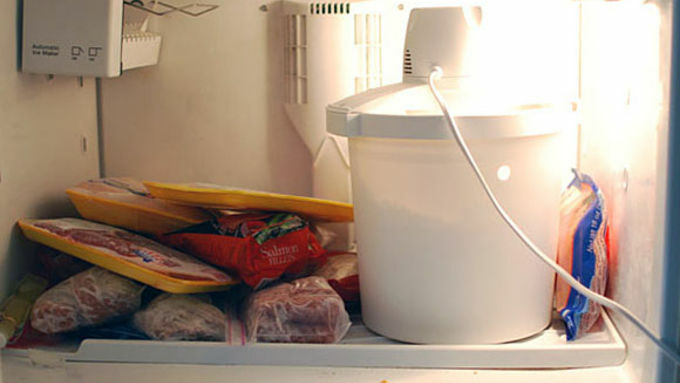 Chill mixture fully, then freeze in your ice cream maker to manufacturer instructions. Fresh out of the ice cream maker, mix in the crushed up graham crackers. Place in the freezer to harden and serve. Here in New England, ice cream consumption doesn't really drop off with the leaves in autumn as you might expect. After working at a small ice cream company for a few years, I realized that September and October were two of our biggest months! 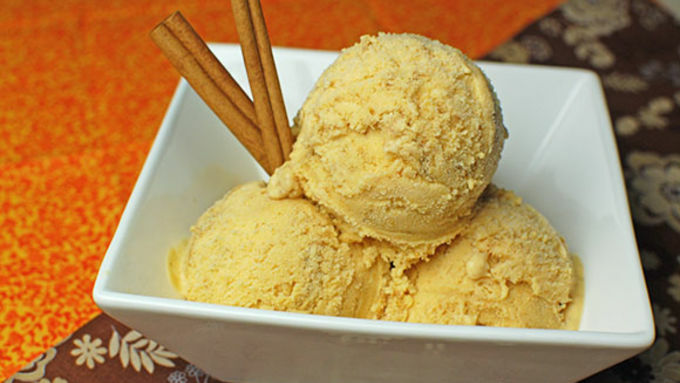 Our biggest seller by far this time of year was this super dense, creamy, and delicious Pumpkin Pie Ice Cream. 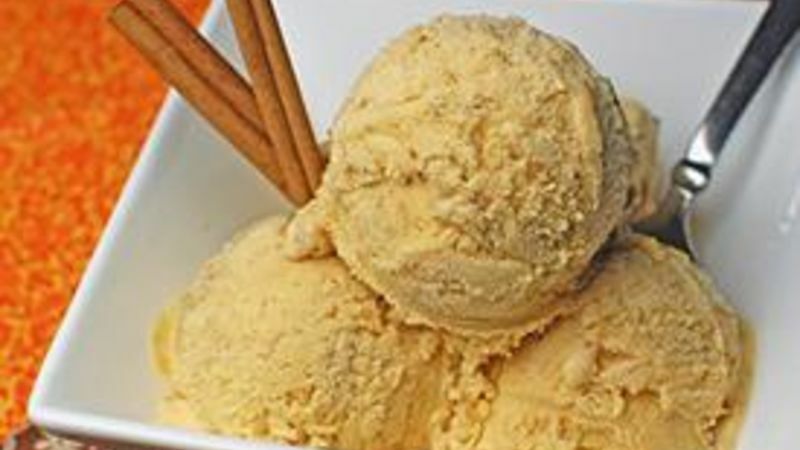 The big secret to making this flavor so luscious on the tongue is to add lots of dried milk powder. The milk powder mixes with the water content in the pumpkin to form a sort of pumpkin milk that prevents the whole thing from getting icy. Finish it off by mixing in graham crackers to emulate the classic pumpkin pie crust. I've used about 20 ice cream makers in my life, ranging from professional models worth tens of thousands of dollars to cheap balls you play catch with until ice cream forms. I have had some real trouble with stand mixer models and some of the mid-price range ice cream makers. What works best for me is a cheap $30 dollar model. Fill it with ice and salt, then put the entire thing right into the freezer (I usually temporarily move freezer goods into a cooler to make space in mine). It works like a charm! The final result is creamy, pumpkin-y and has just a hint of spice.